RCD’s if not fitted in your rental….. 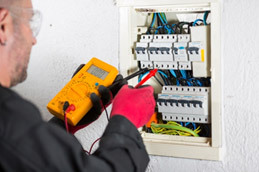 If you own, manage, or live in a rental property, and we do electrical work at your property we must comply with *Regulation 62 of the Electricity (licencing) Regulations 1991 – If the property’s electrical system or equipment appears to be unsafe in the opinion of our electrician we are obligated to report the issue to the owner and also to the network operator. If the property does NOT have a minimum of two RCD’s which are protecting both the lighting and general power outlets, then this property is regarded as unsound, and is therefore in breach of safety regulations. So if you’re unsure, why not get your PRF Electrical electrician booked to inspect your rental for RCD compliance, and whilst they are there, you can ask them about Smoke Alarm and Porch Light requirements also.